It is customary to recite a blessing for Jerusalem (Zion) before the Torah is read during synagogue services, though praying for the welfare of Jerusalem is always an appeal of the Ruach Hakodesh (Holy Spirit). Father of mercies, do good in Thy good pleasure unto Zion, build Thou the walls of Jerusalem (Psalm 51:18). For in You alone do we trust, O King, God exalted and uplifted, Master of the universe. 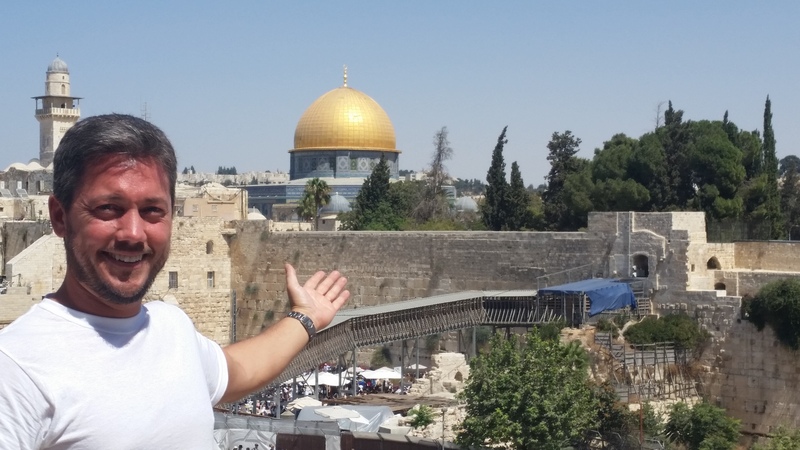 Jerusalem is central to the Jewish heart. When religious Jews pray three times a day, they always turn toward Jerusalem (they also keep a small section of an eastern wall in their house unplastered and unpainted (mizrach) as a sign of mourning for the destruction of the Temple). The Jewish people close the Passover Seder with the words LaShanah Haba’ah Bi Yerushalayim! (“Next Year in Jerusalem”). These same words are invoked to conclude the holiest day of the Jewish year, Yom Kippur. During a Jewish wedding ceremony, the groom breaks a glass as a sign of mourning to commemorate the destruction of the two Temples which stood in Jerusalem. Israel was the new name given to Jacob, which means “ruling with God” (Gen 32:28). For Christians, Jerusalem is the “City of the great King” (Matt 5:35), often understood allegorically to be heaven on earth. It is the place where Yeshua HaMashiach was crucified, buried, resurrected, and ascended to heaven. It is the birthplace of the Church. And it is also the place where the Lord Jesus will one day return as Mashiach ben David to restore the throne of King David in Israel. 1. According to the Jewish sages, God began the creation of the universe there, and the bedrock at Moriah is called Even ha-Shetiyah, “the Foundation Stone,” referring to the creation of the earth on the First Day (Isaiah 28:16). 2. The dust of Moriah is said to have been used to create Adam (who was later placed in the “garden which lay to the East”). As will be seen, man was created from the place of his atonement. 3. According to common Jewish tradition, Moriah was the place that Adam first offered sacrifice, as did his sons Cain and Abel. So did Noah and Abraham. King David and Solomon set the altar for the First Temple there. 4. It was in Jerusalem that Abraham met with Malkhi-Tzedek (Gen 14:18; Heb 7:1). 5. Abraham offered Isaac on Mount Moriah (Gen 22:1-19). This is known as the Akedah or “the binding of Isaac” and clearly prefigures the sacrifice of God the Father of Yeshua His Son. 6. Isaac met his bride there (Gen 24:63-67). This is a picture of the bride of the Messiah. 7. Jacob had his dream of the ladder to heaven there (Gen 28:10-22). 9. King David made Jerusalem the capital of Israel (2 Sam 24:18-25). 10. Solomon built the First Temple there (1 Kings 6-8; 2 Chron 3:1-2). 11. Zerubbabel and Nehemiah built the Second Temple there (Neh 4-6). Later, King Herod (37-4 BC) remodeled it but the Romans destroyed it in 70 AD (the massive retaining wall (the Kotel or Wailing Wall) that encompass Mount Moriah is all that remains of the Second Temple). 12. We are explicitly commanded to pray for the peace of Jerusalem (Ps 122:6). 13. Yeshua called Jerusalem the “City of the Great King” (Matt 5:35) and had special affection for it (Matt 23:37). He attended the festivals there (Luke 2:43, John 2:23), taught there, and performed His sacrificial work there (Matt 16:21). 14. Yeshua was crucified in Jerusalem, just to the north of Moriah at Golgatha (Matt 27:33). There is also sound archaeological evidence to suppose that the place of the crucifixion of Yeshua was at the summit of Mt. Moriah, probably near the present-day Damascus Gate. 15. Yeshua was raised from the dead in Jerusalem (Luke 24:46-7). 17. The Church was born in Jerusalem (Acts 1:4,8,12; 2:1-40). 18. The Apostle Paul kept the Jewish festivals and ceremonial laws in Jerusalem (even after coming to faith in Yeshua as His Messiah – see Acts 18:18; 20:6; 21:20-24) and was willing to be killed there for the sake of Yeshua (Acts 21:13). 19. The writer of the book of Hebrews calls Jerusalem “the City of the Living God” (Heb 12:22). 20. Jerusalem is the place where the Third Temple (tribulation temple) will be built (Rev 11; Matt 24). (Zech 14:4; Acts 1:12; Matt 24). 22. Jerusalem is the place where the Fourth Temple (millennial temple) will be built (Ezekiel 40-45). 23. Jerusalem is the name of the coming paradise of God, which descends upon the earth after the millennial reign of Messiah (Rev 3:12, 21:2, 10). 24. Jerusalem is the most frequently occurring place name in the Scriptures, mentioned over 800 times (Zion is mentioned an additional 152 times). Note that although Scripture sometimes calls all of Jerusalem “Zion,” Mt. Zion lies about half a mile to the West of Moriah. In ancient times a deep valley separated Mt. Zion from Mt. Moriah, but today rubble from Jerusalem’s many destructions completely fills this valley. Just east of Mt. Moriah is the Mount of Olives which is about 300 feet higher than the high points of Mt. Zion or Mt. Moriah. Yeshua ascended to heaven from the summit of the Mt. of Olives according to Acts 1:1-12 and will make his triumphant return to earth from the same location, according to Zechariah 14:4.